Backcountry Character is 5 day immersive summit for high school students. The is a program designed for teens who have a curious nature, a desire to connect and explore, and a passion for this green planet. We’ve build Backcountry Character to help our future leaders develop the skills required to lead, listen and take action. Learning from each other and instructors, participants will also be introduced to new career paths within the outdoor, recreation and forestry industries. 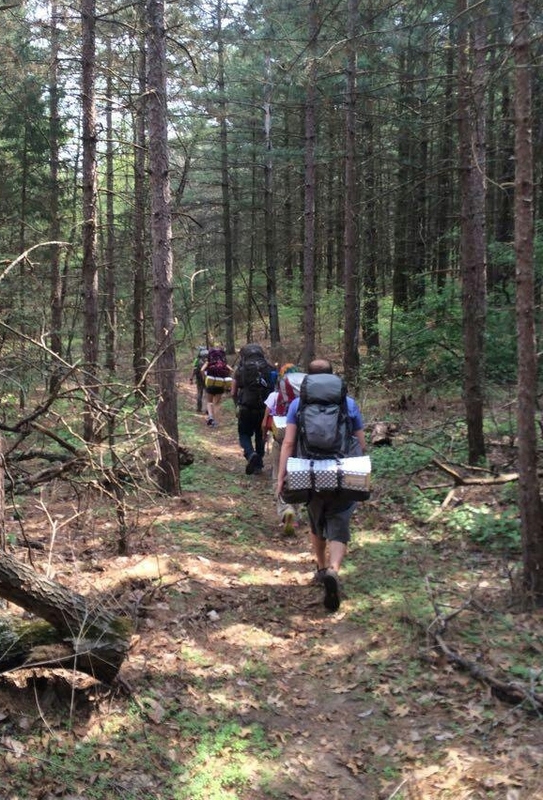 Over the course of 5 days and 4 nights, the group will backpack through the wilderness of the Shawnee National Forest. Students will gain a multitude of skills in order to succeed as they grow into adults by facing new challenges that incite self-discovery, character building, camaraderie and pride. Aside from the challenges of spending the entire time outdoors, students will be positioned to break personal barriers with the help of the team that surrounds them. Challenges such as river crossings, fire making, cooking outdoors, wildlife safety, land navigation and shelter construction are a few of our favorite challenges. Through these challenges the team will a be asked to work together to solve these real-life challenges. They will gain skills in decision making, delegation, leadership, how to follow and how to ask for help. Additionally the group will be exposed to the automatic adversity of the wilderness where we will have no control over the environment. This will encourage the development of a positive mindset as well as deliver focus in the face of adversity. Students will also be exposed to failure, due to the nature of the program and will need to work together to overcome the urge to quit in order to thrive as a team. Students will have the opportunity to meet with a Forest Service educator or wilderness manager. The purpose of this meeting is to learn in depth detail about the natural environment, build a connection to the place we are visiting and to explore career options in wildlife, biology and government. The program cost is $749/person and will be co-ed. An orientation session will be held before the trip to answer any questions. The cost is all inclusive: equipment, food, transport, program and staff are all included. There is a minimum of 5 students and we can accommodate as many as 15. 6 a.m. pickup Thursday, 6/20 Location TBD. Arrive around noon, land recognition, meet with Forest Service educator, hike into backountry. Tour Jackson Falls and surrounding area. Outdoor ethics, self-care and accountability discussion, stretch and hike. 7:30-9 a.m. breakfast, reflection. Leadership discussion; initiative, leading from the front and from the back. 9-2 p.m. lunch on the trail, exploring bluffs, water crossing challenge. The solstice, longest day of the year. Discussion on daily behavior as it relates to sunlight, how do we change as we move off of clocks and onto circadian time? 4-9 p.m. make camp, fire, shelter. Night hike. Tapping into our senses in the darkness to observe, learn and paint a picture of our surroundings and the life around us. 9-2 p.m. lunch on the trail, exploration of the Sand Cave and Crow Knob. 2-4 p.m. finish hike, find camp, set up with shelter challenge. Discussion and review of Ecological Areas we have passed, value in bio diversity and diversity in society. How does diversity benefit life in nature and in our daily lives at home? 7:30-10:30 a.m. breakfast, reflection. Detour to Jackson Hole Falls, Double Branch Falls and search for crystal streams. 10:30-noon. Pack up, lunch at campsite. Noon-3:30 p.m. Hike to specific landmark on the map. Students will rely on skills learned over the trip thus far to navigate the group successfully to our final camp. 3:30-10 p.m. The group will self regulate to ensure needs are met, tasks are complete and time is spent in a structured and organized fashion. This section will be done with little interference from the guides. 7 a.m. Group will continue yesterdays self reliance work and prepare breakfast, clean camp and plan the route out of the forest back to the vehicle. 5 p.m. Expect the group back in Chicago area at TBD pickup. Questions? Call 312-720-1539 or email aaron@adventuresaccessed.com and ask about the Backcountry Character program.